Summary: Summary: Novelist Anne Girard brings to life the mesmerizing and untold story of Eva Gouel, the unforgettable woman who stole the heart of the greatest artist of our time. 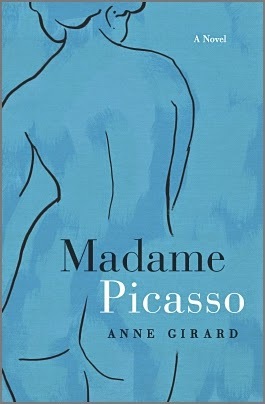 When I first read the description for MADAME PICASSO by Anne Girard, the book definitely appealed to me. I enjoy historical fiction based on real-life characters and I didn't know a whole lot about Picasso, so I figured the book might teach me a thing or two. In addition, I liked that the setting of the story was Paris at the turn of the century and included places like Gertrude Stein's salon and the Moulin Rouge. MADAME PICASSO tells the story of Eva Gouel, a young woman who moves to Paris and gets a job as a seamstress at the Moulin Rouge. She begins to notice a striking man in the audience who happens to be Pablo Picasso, and the attraction ends up being mutual. Even though Picasso is involved with his long-time "wife," he and Eva begin a passionate affair. The book takes the reader through the ups and downs of their relationship and gives glimpses into Picasso's life and works. Eva is portrayed as the love of Picasso's life and his artistic muse, even though their relationship has an unfortunate end. I enjoyed MADAME PICASSO but I definitely didn't love it. I had pretty high hopes for the story, maybe unfairly high ones; and the novel just didn't deliver like I had expected. While I can't really say that there were specific problems with the book, I just think that the characters weren't as complex as I had hoped. I wanted to feel like I truly knew Eva and Picasso and the intricacies of their relationship, and that just didn't happen. Since the novel was primarily about their affair, I felt as if something was missing. What I did appreciate about the novel, however, was how well the author merged fact and fiction. She actually explains some of this in the Author's Notes section at the back of the book. I knew next to nothing about Picasso so I found the bits about his friends and his enemies to be quite interesting. In addition, I liked that the author includes some of the controversies in Picasso's life, especially the hints at his involvement in the heist of the Mona Lisa. I have a feeling that Picasso was a larger-than-life character, and this definitely came out in MADAME PICASSO. In addition, I really liked how well the author brought to life Paris at the turn of the century. I loved the descriptions of the Moulin Rouge and its famous cast of actors and actresses. The details about the shows and the costumes were interesting too. In addition, I really enjoyed learning a bit about the famous artists, writers, and poets who were living in Paris at that time. MADAME PICASSO would make an interesting book club discussion. There is a reading guide in the back of the book along with an interview with the author; however, I wasn't able to find the discussion questions on-line. Some of the themes you might want to discuss include art, passion, love, illness, marriage, grief, loss, and religion. In addition, it might be interesting to talk about some of the real characters in the story including Picasso, Gertrude Stein, and Alice Toklas, as well Paris at the turn of the century. Overall, I liked MADAME PICASSO but I didn't love it. It was an interesting look at the relationship between Eva and Picasso; however, I wanted something more from this novel. Oh, too bad. I had high hopes for this book too. I don't always like historical fiction but liked a book about Vincent Van Gogh and thought this might compare to it. Sorry you didn't love it. It is on my list to read, but not high on my list. It will be good to know going in that it may not be 'the best book ever'!